Yesterday was one of those special kind of days in Canberra. Since my arrival in Australia in 2002, I have thought about Canberra as being at the crossroads of the world. It is not such a busy crossroads now but yesterday countered that quietening. An expert in academic integrity and student support at the University of Canberra. Two visiting criminologists from Cambridge. A Director of Research at the Australian Institute of Sport (AIS). A championship winning netball coach. The whirlwind ended sitting in on a workshop (at the invitation of a performance analyst) with the Diamonds netball squad in the Old Ressies at the AIS. Conversations about data and analysis were integral to all these meetings. All of them helped me to contemplate the content of a Smart Talk I hope to present on 17 October at the AIS. I have a draft of my talk here. I aim to combine some insights from Immanuel Wallerstein, firefighting and conversations with coaches to explore the governance of high performance sport. A world-system is a social system. Its life is made up of the conflicting forces which hold it together by tension and tear it apart as each group seeks eternally to remold its advantage. … it has a life-span over which its characteristics change in some respects and remain stable in others. The ‘remolding’ of advantage takes place in a world-system that has core states and peripheral areas. I am keen to explore what these insights might tell us about a national sport strategy that seeks a winning edge. I thought I would share my work in progress here after a day at the crossroads. I learned this week of the death of Brian Johnson. We met when I was at the Australian Institute of Sport. Brian was the founding head coach of the Rugby League program at the Institute. He had an enormous impact on my thinking about coaching. I was fascinated by his technical and tactical understanding of the game. He was a remarkable coach of young athletes. I enjoyed our conversations about coaching and life when he let his guard down and we talked about philosophy. In his time at the AIS he assembled a remarkable coaching staff around of him. In his absence we talked in whispered voices about his vision and clarity. We shared our awe of him. I learned from him too the advantages of plain, honest speaking … as well as the power of non-verbal communication. I did try to tell him how much he had helped me but he usually brushed this off with some of his straightforward speaking. However, there were moments, when I distracted him with conversations about Warrington, that he almost accepted praise. I was very fortunate that our paths crossed. I am the better for our meeting and at a loss at his death. Vale. Twitter picture shared by Craig Walton. AIS Rugby League News 2010. Twitter picture shared by The Dragons. Roy Masters has writing a beautiful tribute to Brian in The Sydney Morning Herald (18 January). It is the end of the Honours’ year in Sport and Exercise Science at the University of Canberra. This year I have had the opportunity to be a member of James Simpson’s supervision team. James is a postgraduate scholar in Performance Analysis at the Australian Institute of Sport. He has been investigating Changes in Tactical Behaviour in Elite Women’s Water Polo. I am mindful that James will be submitting a paper for peer review and so I will not preempt any submission he makes by sharing the detail of his research here. I do want to share an outline of his work here to add another example to the literature on the occupational culture of a performance analyst. In October 2014, the Fédération Internationale de Natation (FINA) approved a rule change in junior and youth water polo. Overall team size was reduced from thirteen to eleven. The number of players from each team in the pool during a game was reduced from seven to six, of which one must be the goal keeper. The rule change was used for the first time in international competition at the 2015 Under 20 World Championships. James worked with the head coach of the Australian women’s team at the World Championships. James journey to provide a performance analysis service at the Under 20 World Championships followed a classic service model approach. Preliminary discussions between the AIS and Swimming Australia. Preliminary meetings between the head coach of the junior women’s team and James, the analyst. Agreement about priorities for the coach. Agreement about real-time and lapsed-time services. Confirmation of digital technology resources for the project. Logistics for accreditation, travel, accommodation and subsistence agreed and confirmed. Delivery of the service at the championships. The venue for the championships was changed relatively close to the championships: a trip to Mexico became a trip to Greece. At the venue, despite assurances from the organisers, James was not able to film from the agreed position in the pool. The second of these did place a great deal of stress on James as there was no official video record of the championships. James overcame these obstacles and as a result has a total record of the championships for his archive and for subsequent analysis. He was sufficiently well organised to be able to code events in the pool in real time and then to add detail and check for accuracy with lapsed-time analysis. Whilst James was exploring some statistical tests to compare behaviours in new and old rules, my colleague Chris Barnes and I went off on a tangent to look at some machine learning possibilities for the data James had collected. 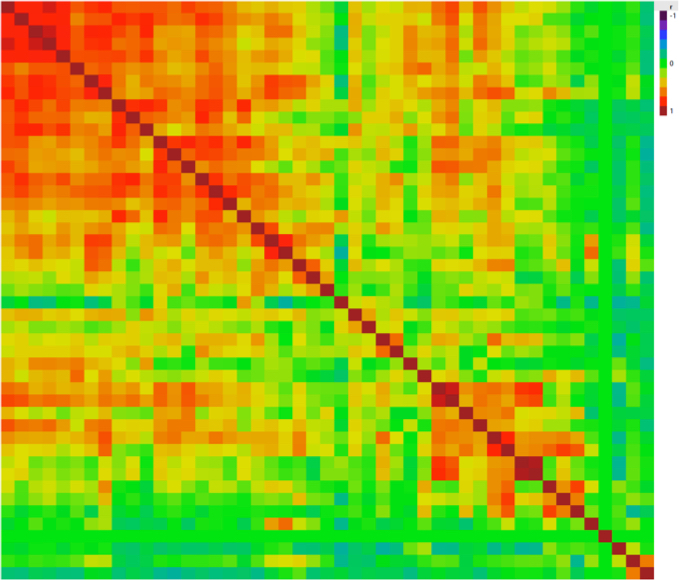 The dark red diagonal line shows maximum correlation. This started us off thinking about how we might classify games by data alone … and how many additional games we might need to make our approach much more robust. This is not reported in James’ paper. It suggests a fascinating line of enquiry in an abstract approach to behavioural change in games where the rules have changed. It demonstrates, I think, the growing knowledge performance analysts will develop as they start to interrogate data collected with traditional performance analysis methods. I am looking forward to the response of peer reviewers to James’ paper. There will be lots to discuss. In the meantime, Chris and I will continue on our tangent.